ClamCase makes an excellent, keyboard/case combination for the Apple iPad series, both standard and mini versions are available. Clamcase, now offering the high-quality, ‘Pro series’ effectively gives your iPad the look, touch and feel of a Macbook Pro, with touch screen convenience. If you use your iPad for extensive data input (typing purposes), the ClamCase is a must have because the quality of the keyboard is probably the best available on the market. Without a doubt, the first habit you will find yourself trying to break, is reaching for that Macbook Pro style touch pad, which doesn’t exist on ClamCase Pro. You’ll chuckle and then re-direct your ‘fingers to do the walking’ on the directly on the iPad touch screen. This, in itself, is a testament to the excellent quality of the ClamCase Pro – so good, so smooth, you’ll forget you’re not actually working on your MacBook. 1. Immediately charge-up the ClamCase. Plug the included ClamCase USB cable into the mini USB charging slot found on the right side of the ClamCase. You will need to utilitze your existing iPad charging block in order to plug this ClamCase USB charging cable into a wall outlet. Original charging will take a few hours but rest assured, the ClamCase Pro retains its charge for a long time and depending on how much you use the ClamCase, you might not have to recharge for a month or so. There is a charge indicator light located on the top right surface of the keyboard. *Remember to charge up your iPad separately as well. 2. Gently and carefully, secure your iPad (or iPad mini) into the polycarbonate upper shell. There is a particular ClamCase Pro case which is available for each particular iPad model in order to accommodate iPad thickness, camera positioning and connection holes. And as mentioned ClamCase had recently released ClamCase Pro for the iPad Air 2 which perfectly fits the new Air 2’s super thin design and repositioned rear camera. 3. Turn on the ClamCase (once fully charged) using the very tiny black slider button which is found on the left side of the ClamCase keyboard. The ON/OFF slider is not on the top surface but on the left SIDE and you will have to look closely to be able to see the tiny white letters indicating the on/off positions. 4. Set up Bluetooth once the ClamCase is fully charged. Bluetooth pairing with your iPad is simply a process of opening up the pairing preference panel on the iPad and then pushing the Bluetooth pairing button that is found on the lower right portion of the keyboard surface. Once the ClamCase Pro and the iPad are Bluetooth paired, the pleasure and delight of using the ClamCase will be apparent. The iPad and ClamCase Pro are automatically in the OFF position when the ClamCase lid is closed. If the lid is fully extended 360 degrees the iPad remains on and can be used in the touch screen mode only as the ClamCase keyboard is conveniently disabled for this practical purpose. Flip open the ClamCase Pro lid then use either the touch screen to input your security code or use the ClamCase Pro keyboard to input your security code to access your iPad. The ‘Home’ button on the top row of the keyboard surface will always conveniently return you to to the home page of your iPad. There are keys to control a variety of iPad features including navigating around iTunes, however the functionality of this marvellous ClamCase keyboard is primarily that a data input, or typing style keyboard. The ClamCase keyboard feels great, tactile and to me feels as good as a MacBook Pro keyboard. 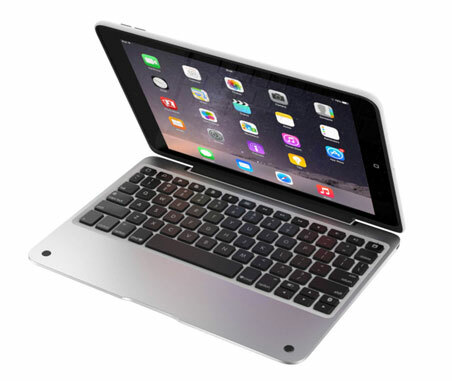 If typing and data input play a big role in your daily iPad routine, then the ClamCase Pro keyboard and case is a winner. Keep in mind that the iPad can be easily installed and easily removed from the poly carbonate lid when traditional iPad usage is desired – with ClamCase Pro, you get the best of both worlds! View the magnificent ClamCase Pro Promo video to get a feel for this wonderful product. The ClamCase Pro adds weight and bulk to your iPad, but what else would you expect from a high quality, aluminium keyboard case. 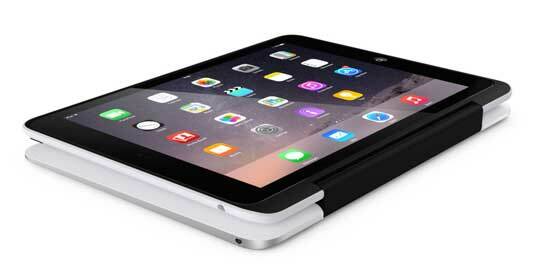 The Polycarbonate ClamCase Pro top is quite adequate to house the iPad and also keeps additional weight to a minimum. Really it is a small price to pay when considering what this ClamCase Pro provides. The ClamCase Pro reduces the weight of your savings account as it sells for about $170.00. But there are several offers available from ClamCase that accommodate a $20 discount so the ClamCase Pro for the iPad can be obtained for $150.00 including FREE shipping. All in all, the ClamCase Pro is a high quality, well constructed keyboard and case which is a beautifully designed compliment to the Apple iPad series. With the ClamCase Pro you will feel like you have an Apple MacBook with touchscreen capabilities, no touch pad but touchscreen which is very very cool. Oh an one more thing, just remember to the ON/OFF switch to the ON position if you ever open the ClamCase Pro lid and get no response from the iPad. Getting in the habit of flipping the ON/OFF switch when the ClamCase Pro lid is closed is not necessary because both the case and the iPad are in sleep mode. ClamCase is a product that will bring much pleasure to using the iPad if you prefer accees to a wonderful keyboard in addition to the touch screen capabilities that we all know and love with the Apple iPad. ClamCase Pro gets a 5 star rating for excellent service and high quality performance, superior design & attention to detail.